In one of the 20th century’s most disastrous collisions of political ideology and science, the Russian botanist Trofim Lysenko steered the USSR’s agricultural research policies to deemphasize the deterministic concepts of Mendelian inheritance. Instead, Lysenko was committed to the idea that, within the space of a single generation, the environment could alter the phenotype of future generations, an idea that is now often (imprecisely) referred to as “Lamarckian” inheritance. In Lysenko’s view, Mendelian inheritance, along with Darwinian evolution, emphasizes competition, whereas he believed that biology was based on cooperation, and that hard work in one generation should rapidly lead to the betterment of the species. Lysenko was among the most infamous purveyors of the idea that the environment experienced by an organism could influence the phenotype in future generations, and he was rightly denounced as a charlatan because he falsified results in pursuit of his goal. However, the scientific community has discovered over the past few decades that the idea that acquired characters can be inherited may not be completely off the mark. 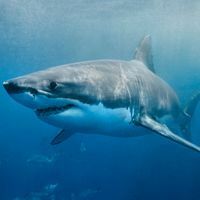 It turns out that epigenetic marks, information not encoded in the genome’s sequence, do respond to environmental conditions within an organism’s lifetime, and recent evidence suggests that such information may be inherited. These findings have helped motivate modern research into the oft-discredited study of transgenerational effects of the environment. Researchers are now beginning to understand the mechanisms of epigenetic inheritance and to generate evidence for the idea that the experiences of an ancestral population can influence future generations. BEYOND DNA: While the haploid DNA of the sperm and egg contain the blueprint for offspring, numerous molecular processes beyond genomic inheritance may transmit information from one generation to the next. Such epigenetic mechanisms can convey information about the parents’ diet, stressful experiences, and environmental exposures, influencing offspring phenotype in diverse ways. See full infographic: WEB | PDF© SCOTT LEIGHTONTransmission of traits from parent to child is a universal characteristic of life as we know it, and is central to the process of evolution. Nevertheless, evolutionary theory has long outpaced our understanding of the biological mechanisms of inheritance. When Charles Darwin published On the Origin of Species in 1859, for example, Gregor Mendel was only just beginning to formulate his ideas of genetic heredity based on his experiments with pea plants. And it would be nearly another century before researchers elucidated the double-helical structure of DNA, providing us with a clear understanding of how genetic information is copied and passed on to offspring. More complicated still is the inheritance of information beyond the sequence of the genome, so-called epigenetic inheritance. A relatively straightforward example is cell-fate inheritance. Although every cell in your body carries basically the same genome, when a liver cell divides it always makes two liver cells, never a skin cell. At one point, researchers hypothesized that differentiation into particular cell types involved permanent loss of portions of the genome. But beginning in 1958, English developmental biologist John Gurdon showed that it was possible to generate an intact tadpole by injecting the nucleus from a differentiated cell into the cytoplasm of a frog ovum, disproving the idea. 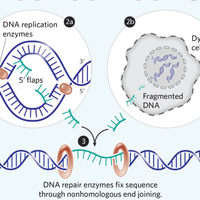 Instead, the inheritance of cell type is mediated by the passing on of transcription factors, and of epigenetic marks on the genome and on the histones around which DNA is wrapped. Not only is epigenetic information inherited during cellular division, but it can also be passed from one generation to the next in multicellular organisms, a phenomenon known as transgenerational epigenetics. This requires that epigenetic information be carried in the gametes—sperm and eggs—and be maintained throughout the dramatic changes that occur during gamete production, fertilization, and early development. While researchers once considered this unlikely, recent studies have begun to demonstrate that parents can and do pass on epigenetic information to their children. Perhaps the earliest description of transgenerational epigenetic inheritance was the discovery of paramutation in maize in the 1950s.1 Plant geneticist R.A. Brink of the University of Wisconsin showed that the repressed allele of a gene involved in pigment synthesis could somehow convert an active copy of the same gene to an inactive state. When passed on, this inactivated “paramutant” allele could similarly convert an active copy of the gene to the paramutant state in the plant’s offspring, with this silenced state being stable for hundreds of generations. These and other model systems provide evidence that inheritable epigenetic information exists alongside the inheritable DNA sequence. In addition to RNAs and prion proteins, epigenetic information carriers include covalent modifications to nucleotides and histones, providing a wide variety of mechanisms that enable organisms to transmit information extragenomically. (See illustration above.) And the increasing acceptance of transgenerational epigenetics has, in turn, spurred renewed interest in the possibility that ancestral environmental conditions might influence the phenotypes of future generations. This idea, often referred to as the inheritance of acquired characters, was one aspect of Jean-Baptiste Lamarck’s early evolutionary theories. But the current use of “Lamarckian inheritance” to refer to transgenerational epigenetic inheritance is something of a misnomer. In fact, the inheritance of acquired characters was hardly the defining feature of Lamarck’s beliefs. His evolutionary theory did not include the basic concept of natural selection, and did not have a place for phenotypic variation existing prior to environmental challenges. Moreover, both Darwin and Lamarck believed that traits acquired in one’s lifetime could be passed on. Famously, Darwin even developed a model of inheritance that invoked “gemmules,” which carried information from all parts of the body to alter the characteristics of the next generation. Today, a number of studies document a link between ancestral environmental conditions and changes in offspring behavior or metabolism, potentially validating some of the thinking of both seminal evolutionary theorists on this topic. It is now becoming clear that the environments of both the mother and the father can influence offspring phenotype. One of the earliest connections between environmental conditions affecting human parents and disease rates in their offspring was made in the late 1980s by British epidemiologist David Barker, who noticed that babies with low birth weights were significantly more likely to suffer from diabetes and coronary heart disease later in life.4 He proposed what is now known as the “thrifty phenotype” hypothesis: in response to inadequate nutrition during fetal growth, a person will exhibit a long-lasting physiological response of aggressively storing calories. This thrifty phenotype then wreaks havoc when and if times of plenty return, leading to obesity and other diseases related to caloric excess. It is now becoming clear that the environments of both the mother and the father can influence offspring phenotype. 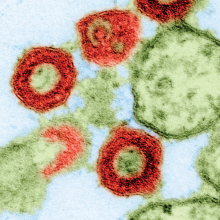 These human studies have been supplemented by hundreds of experimental investigations using a variety of mammalian models. In such studies, pregnant female animals are either subjected to a significant caloric restriction or are surgically treated to restrict the main blood supply to the uterus. In both scenarios fetal growth is inhibited as a consequence of poor access to nutrients. As seen in human cohorts, rodents and other animals subjected to in utero growth restriction exhibit a multitude of changes in metabolism, including poor insulin release and insulin resistance—two factors relevant to type 2 diabetes in humans. Importantly, even though animals starved during gestation are then provided with sufficient access to food for the remainder of their lives, the early conditions somehow establish lifelong metabolic changes. 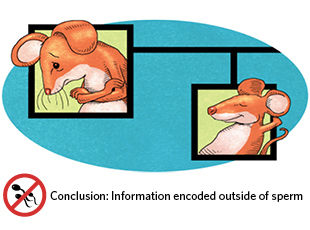 A large field is dedicated to understanding how animals “remember” conditions present transiently early in their lives. But the fact that environmental conditions affecting a mother can influence the phenotype of her offspring is not in itself greatly surprising, as the womb is a baby’s first environment. Mothers who drink heavily during pregnancy are exposing their babies to a toxin and may give birth to children with fetal alcohol syndrome. Much more curious than maternal effects on children are cases where the lifestyle or history of the father has been implicated in disease risk of his children. 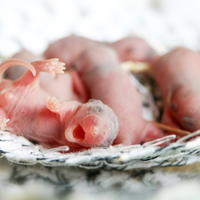 To determine whether a father’s experiences are passed down to his offspring via his sperm or some other mechanism, researchers can breed mice via in vitro fertilization (IVF), which uses purified sperm to fertilize an egg. If the effect is still apparent, this points to an epigenetic mechanism within the sperm itself. If the effect disappears, this suggests that the relevant information may be located outside of the sperm, such as in the seminal fluid. Male mice exposed to different odorants paired with foot shocks sire offspring with greater sensitivity to those odorants. 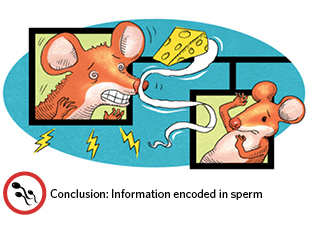 Odor sensitivity is affected in offspring generated via IVF, and the effect is transmitted to those mice’s offspring as wellsubjected to social defeat spend less time in exposed areas and exhibit other anxiety-related behaviors. 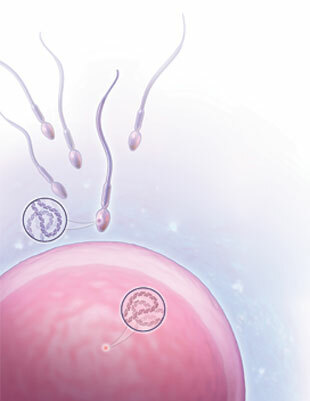 When the sperm of these socially defeated fathers is used to sire offspring via IVF technology, however, the offspring are normal. Already, a large number of studies in rodents have shown that altering a father’s diet can influence a number of metabolic traits in his offspring. The typical experimental paradigm used for such studies involved separating male siblings from one another and providing one brother a control diet and the other an altered diet, low in protein or with excess fat. At sexual maturity, each brother was mated with a female who had been fed a control diet. 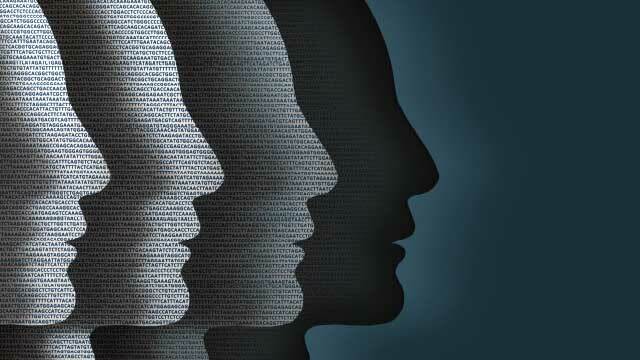 Researchers then examined the offspring for various phenotypes, most commonly, metabolic features or behavioral traits such as anxiety-related activities. In multiple studies of this sort, paternal diet was shown to affect glucose control, cholesterol metabolism, blood pressure, and other cardiovascular measures in offspring. In addition to studies focused on paternal diet, several studies have shown that males subjected to undernutrition in utero—the male offspring of mothers subjected to starvation during pregnancy—can sire offspring with altered glucose and lipid metabolism.7 These rodent studies are complemented by research in other mammals such as pigs, as well as by human epidemiological studies. This body of work suggests a link between access to food and metabolic phenotypes in one’s offspring, and possibly in future generations as well. Studies of stress, diet, and additional environmental stimuli such as toxin exposure all strongly support the idea that a father’s environment can influence the phenotype of his offspring. How exactly is this information transferred across the generations? In principle, huge amounts of information could be transmitted to offspring in sperm, as millions of genomic cytosines can each potentially transmit a “bit” of information in the form of an attached methyl group. Researchers have recently discovered that the vast majority of cytosine methylation on the paternal genome is erased at fertilization, but proteins and RNAs in the seminal fluid or in the sperm may also carry information, as could sperm chromatin packaging. How much detail about a father’s lifestyle sperm really passes on to his offspring remains unclear, however. One recent study provides support for the “high bandwidth” hypothesis, in which a very detailed account of a father’s experiences is transmitted in his sperm, as opposed to a more general quality-of-life summary. Neurobiologists Brian Dias and Kerry Ressler of Emory University exposed male mice to different odorants while stressing them with foot shocks, conditioning the mice to startle when they merely smelled the shock-associated odor. Offspring of these mice showed greater sensitivity to just the specific odorant that had been paired with the foot shock for their fathers. Smell is mediated by binding of odorants to a large family of olfactory receptors. Dias and Ressler found that the offspring of the fear-conditioned males had more neurons expressing the olfactory receptor specific for the shock-paired odor.10 This finding raises the exciting and surprising possibility that sperm can transmit thousands of bits of information to offspring. If odorants can induce specific responses in offspring, why not other factors such as hormones, and so forth? It will be very exciting to see whether other labs have similar results with effects on offspring of paternal exposure to odorants and other small molecules. Although epigenetic marks on sperm DNA seem the likeliest carrier of paternal information, fathers transmit much more to mothers and children than sperm. One way to experimentally probe the question of how a father transmits information to his offspring is to breed rodents using assisted reproductive technologies, such as artificial insemination or in vitro fertilization (IVF), that use purified sperm to fertilize ova. In the case of Nestler’s social-defeat paradigm, IVF experiments using sperm from control or defeated male mice did not reproduce the effect in offspring, indicating either that the relevant paternal information is located outside of sperm (perhaps in the seminal fluid), or that the disruptive process of IVF and embryo culture might somehow prevent accurate transmission of sperm information to progeny. In contrast, in Diaz and Ressler’s study pairing odorants with foot shocks, odor sensitivity was also affected in offspring generated via IVF using sperm from exposed versus unexposed male mice. While it is clear that the conditions experienced by parents can affect their offspring’s metabolism and risk for various diseases, it is important to be cautious in interpreting what this means for human health. In our lab, we find that paternal diet explains perhaps 10 percent of the overall variance in cholesterol metabolism among inbred mice. In other words, factors outside of the father’s diet can alter cholesterol metabolism to a far greater extent than paternal diet, even in genetically identical animals held in carefully controlled conditions. Other paternal effects are similarly subtle, presumably one of the reasons why paternal environmental effects have only been uncovered in the past decade or so. The next decade or two should be an exciting time as we learn more about what, how, and why we tell our children about the world around us before they’re even born. Oliver Rando is a professor in the Department of Biochemistry and Molecular Pharmacology at the University of Massachusetts Medical School. His research interests include structural analysis of the yeast genome and the mammalian sperm epigenome. M.A. Arteaga-Vazquez, V.L. Chandler, “Paramutation in maize: RNA mediated trans-generational gene silencing,” Curr Opin Genet Dev, 20:156-63, 2010. A. Fire et al., “Potent and specific genetic interference by double-stranded RNA in Caenorhabditis elegans,” Nature, 391:806-11, 1998. R.B. Wickner, “[URE3] as an altered URE2 protein: Evidence for a prion analog in Saccharomyces cerevisiae,” Science, 264:566-69, 1994. C.N. Hales, D.J.P. Barker, “Type 2 (non-insulin-dependent) diabetes mellitus: The thrifty phenotype hypothesis,” Diabetologia, 35:595-601, 1992. L.H. Lumey et al., “Prenatal famine and adult health,” Annu Rev Public Health, 32:10.1146/annurev-publhealth-031210-101230, 2011. O.J. Rando, “Daddy issues: Paternal effects on phenotype,” Cell, 151:702-08, 2012. J.C. Jimenez-Chillaron et al., “Intergenerational transmission of glucose intolerance and obesity by in utero undernutrition in mice,” Diabetes, 58:460-68, 2009. A.B. Rodgers et al., “Paternal stress exposure alters sperm microRNA content and reprograms offspring HPA stress axis regulation,” J Neurosci, 33:9003-12, 2013. D.M. Dietz et al., “Paternal transmission of stress-induced pathologies,” Biol Psychiatry, 70:408-14, 2011. B.G. Dias, K.J. Ressler, “Parental olfactory experience influences behavior and neural structure in subsequent generations,” Nat Neurosci, 17:89-96, 2014. K. Gapp et al., “Implication of sperm RNAs in transgenerational inheritance of the effects of early trauma in mice,” Nat Neurosci, 17:667-69, 2014. A.B. Rodgers et al., “Transgenerational epigenetic programming via sperm microRNA recapitulates effects of paternal stress,” PNAS, doi:10.1073/pnas.1508347112, 2015.